SAP SE63 transaction is used for Smartforms translation to different target languages and SLXT ABAP report is used to export translation text to other SAP system. Especially if you are a SAP Smartform developer or ABAP developer who is creating an output in different languages, you can use SE63 tcode for translating static text like titles, headers, etc. And ABAP program SLXT can be executed for creating a workbench task for export to other SAP systems covering target language translations of specific Smartform objects. This SAP tutorial shows how to use SE63 transaction for translating Smartform document into different languages. Then tutorial will continue step by step execution of SLXT ABAP program to package text translation into an ABAP workbench request. And as the last step, we will export Smartform translation to other system using SE09 transaction in this SAP Smartform tutorial. After you select Other Long Objects in SE63 translation SAP screen, we will select SAP Smart Form object. After Smartform object type is selected, in the following SAP screen we will provide form name in Object Name filter criteria. Leave unchanged the Translation Area textbox. Enter the source language which is the original language of the Smartform object you want ot translate from. Anter in target language textbox, provide the four character language code which you want to translate into. In this SAP tutorial example I'll translate Smartform from Slovenian into English. So I enter slSI in source language and in target language I provide enUS English US. The next screen enables SAP Smart Form developers to translate text in source language to target language. The screen is divided into two sections where in first one developers can see the original text. And in other section, Smartform developers can edit translated text in target language of the form. The top readonly section is displaying original text from source language. And editable bottom section is showing target language texts which can be modified by the developer for the target language translation. 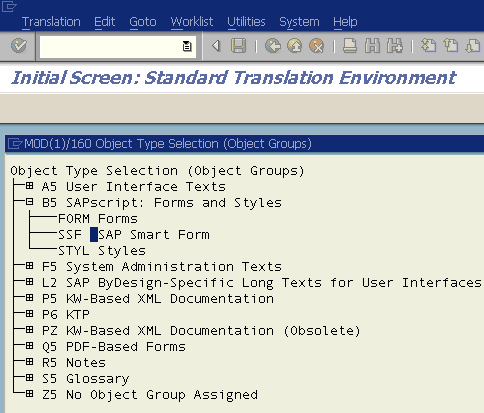 You can add new lines for target language text translation of the source SAP Smartform object. It is also possible to delete existing lines. Press Save Active button to save changes on Smartform translation and activate changes using SE63 tcode. You can now exit SE63 text translation transaction with F3. At this point you can the translation changes you have done on the current system. But if you want to export translation changes to other system, we need to create a transport request. We can create a workbench request which will include SAP Smartform translation changes using a standart SAP report SLXT. After ABAP developers translate Smartform into other languages, they need to create a workbench request and transport this request including Smartform translations into other systems. 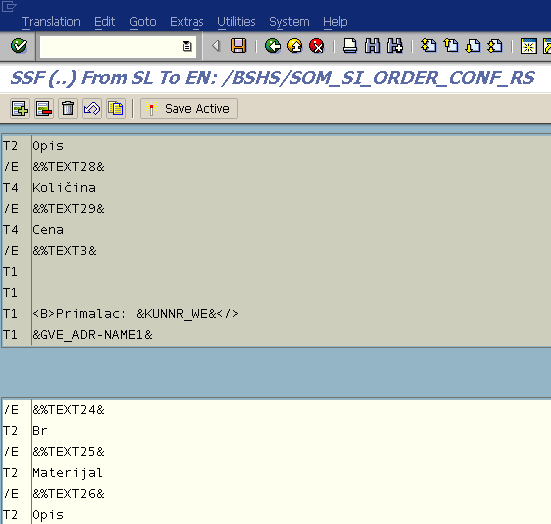 The SAP transaction SLXT (Translation Export) is used to package translations into workbench request object. ABAP tcode SLXT can be used for other object translations too besides SAP Smartform translation export. Since we want to export only Smartform translation, you can also provide SSF criteria in Filter section Object Type filter option If you have made SE63 translation of source SAP Smartform object, you can enter your SAP username in Object Processor criteria to add an aditional filter.